Our MOSAIC and FUSED GLASS WORKSHOPS are a great way to learn a new skill, have a lot of fun, and leave with some wonderful works of glass art. Not to mention the therapeutic value. Teaching has long been a passion of Tom and Saundra and they has taught over 500 mosaic and fused glass enthusiasts at the design center in Charlotte, North Carolina. Tom is also a part time instructor at Delphi Glass in Lansing, Michigan (www.delphiglass.com) and has taught at renowned faux painter Gary Lord’s studio in Cincinnati, Ohio. Students have come from as far away as an island off the coast of Washington State, Mexico City, Maine and Australia. 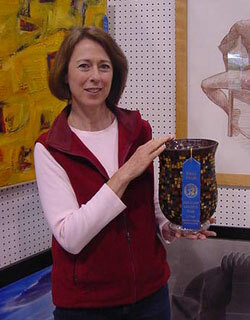 OUR MOSAIC AND FUSED GLASS WORKSHOPS ARE TAILORED TO ALL LEVELS OF EXPERIENCE. We have enjoyed fathers and daughters, mothers and daughters, grandparents and grand children, husbands and wives, groups of home schoolers, family groups, children from The Relatives crisis center, etc. Please take a couple of moments to scroll through the photo gallery of past mosaic and fused glass workshops – filled with lots of smiles and great glass creations. We can also provide Gift Certificates for Workshops. Contact us for details. Here is our new schedule of Mosaic and Fuse Glass Workshops for early 2016. Click on your selection for class description and online registration. 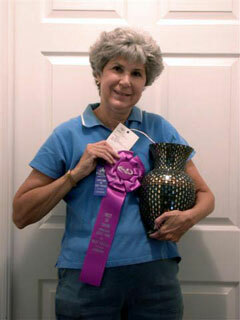 Gail won a Blue Ribbon and “Best in Show” at the West Virginia State Fair! Madelyn won a First Prize Blue Ribbon at the San Juan County Fair!